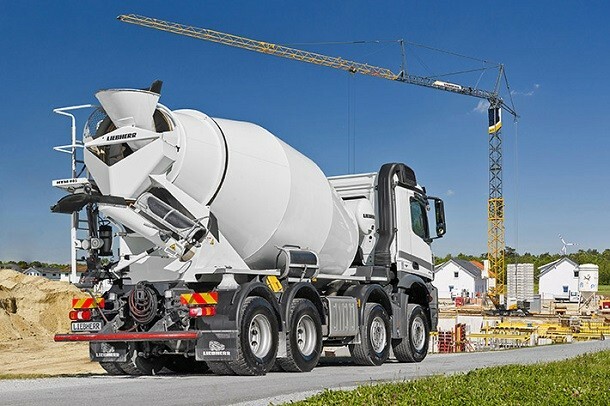 Latest from the manufacturer's range, the concrete mixer HTM 905 by Liebherr will start being used. Safer, more efficient and more comfortable, this new generation of machine is a mix of innovations. The new platform from the concrete mixer make it easier to assemble, tidy and access the accessories safely and easily for the operator. Similarly, the larger capacity of the tank avoids involuntary spillage of fluid loads, and the optional Litronic-EMC command protects against untimely errors. Now it is impossible to activate the back command for unauthorized people since it can now be disabled when moving. A special kind of steel exclusively made for Liebherr : the LICRO 500. Made of titanium carbonitride with a high level of chromium, it increases the tear resistance of the tank and its longevity. The design of the tank has also been changed and improved. By reducing the empty weight by 300 kg, the useful load has been increased. By getting rid of the inside pegs and smoothing the surfaces, the cleaning is much more easy and less frequent. The Constant-speed-Drive feature warns of the unnecessary rotations of the tank during transport. With all these changes, it results in fuel, time and tear savings. In order to use the accessories more easily in different situations, lot of changes have been made. The fixing for the chute extension have different positions. The concrete transfer device has been changed. Now completely pivoting, moved 120 mm to the top, the chute has an optimum concrete flow stream and a new brake that can be activated in one move. More spacious, the new platform is equipped with a lighter aluminium ladder that slides. The operator is also protected against bad weather with an optional roof at the back. Standard , light model with all options, the new concrete mixer by Liebherr can be set up online and visualise from all angles. The concrete volume load adds up automatically during setup. The different combinations help customise and adapt the materials to the construction sites are saved online in case of need of an estimate. The system articulates around the need of the user, his safety and comfort while optimising profitability.